This new annotated edition of The Defense of the Faith restores the full text of the original work in a form that is more easily understood. 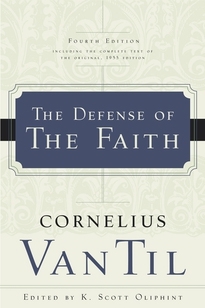 Cornelius Van Til, who taught for more than forty-five years at Westminster Seminary, sometimes used philosophical vocabulary in The Defense, and many of his conversation partners and critics were not widely known. When later editions greatly abridged this work for these reasons, valuable discussions were laid aside. Now they are restored, and with added clarification. Newly edited and retypeset, this unabridged edition features a foreword and explanatory notes by K. Scott Oliphint, which help us grasp a method of apologetics consistent with the nature of Christianity itself and continually relevant to our time. "The original version is back, with Scott Oliphint’s excellent foreword and explanatory footnotes. Now Van Til is much more understandable, and his opponents too. How stimulating it must have been to be part of that dialogue in the early days of Reformed apologetics! We need that stimulus now if we are to deal with unbelief in a God-honoring way." "This new edition provides an enormous service to the reader. The somewhat challenging text is abundantly illuminated by Scott Oliphint, no doubt the leading expert on Van Til in our times." "Though Van Til often engages ideas, terms, and conversation partners unknown to contemporary, this work also has a delightful effect in exposing the pretensions of human autonomy and the grandeur of God’s sovereign grace. In his careful, thorough, and sympathetic notes, Professor Oliphint has done us all a tremendous service." Cornelius Van Til (1895–1987) was born in Grootegast, the Netherlands, and immigrated with his family to America in 1905. He attended Calvin College and Calvin Seminary before completing his studies at Princeton Theological Seminary and Princeton University with the ThM and PhD degrees. Drawn to the pastorate, Van Til spent one year in the ministry before taking a leave of absence to teach apologetics at Princeton Seminary. When the seminary reorganized, he was persuaded to join the faculty of the newly founded Westminster Theological Seminary. He remained there as professor of apologetics until his retirement in 1975. Van Til wrote more than twenty books, in addition to more than thirty syllabi. Among his best-known titles are The Defense of the Faith, A Christian Theory of Knowledge, and An Introduction to Systematic Theology.